Finally, its here! 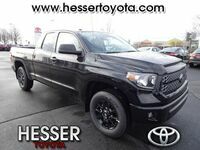 After months and months of waiting, Toyota truck lovers can finally get their hands on the new full-size 2019 Toyota Tundra! 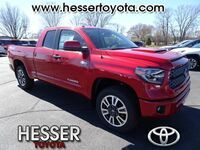 Have you heard about the new 2019 Toyota Tundra? Are you looking to learn more? Then you’ve come to the right place! We create these model research pages to give drivers an in-depth look at the newest Toyota vehicles to help make the car-buying process a little easier. Now, for this page, we’re going to dive deep into the new 2019 Toyota Tundra! The Tundra has long been the biggest and most capable truck in the Toyota lineup, and 2019 will be no different as Toyota Tundra is more powerful and more capable than ever! But, the 2019 Toyota Tundra is not only stronger but smarter than ever too! We’re going to break down everything about the 2019 Toyota Tundra from its engine specs to its safety features, right here! Why not start with what truck drivers love, the engine! The 2019 Toyota Tundra has two different powertrains for drivers to choose from, both offering incredible performance. First, there’s the 4.6-liter Aluminum I-FORCE 32-valve V8 engine that pumps out an impressive 310 horsepower and 327 lb-ft of torque. Then, for even more power, there’s the 5.7-liter Aluminum I-FORCE 32-valve V8 that offers an incredible 381 horsepower and 401 lb-ft of torque. Of course, all that raw power is nice, but what matters is putting it to good use. You don’t have to worry about that when it comes to the 2019 Toyota Tundra because it doesn’t waste an ounce of power. 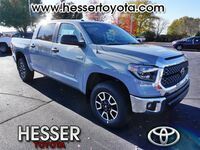 With the available 5.7-liter V8 and properly equipped, the 2019 Toyota Tundra can tow up to 10,000 pounds! 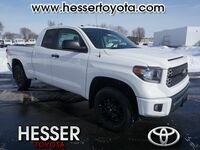 Plus, the 2019 Tundra makes towing easier with helpful features like the TOW/HAUL Mode and Trailer Brake Controller and standard Trailer-Sway Control. It’s not all about power and performance with the 2019 Toyota Tundra, though. It also offers a world-class interior that is designed and optimized for premium comfort and versatility. The dual zone automatic climate control makes sure everyone is at their perfect temperature and the fold-up rear seats allow for maximum versatility! Want to learn more about the 2019 Toyota Tundra? Ready to get behind the wheel of one? 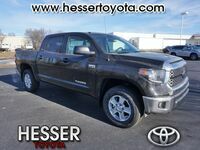 Contact our staff at Hesser Toyota in Janesville, Wisconsin, for more information or to schedule a test drive today!